It seems that no matter how many musical endeavors he takes on, Julian Casablancas will continue to have tricks up his sleeve. Casablancas is probably best known for his time in the iconic New York-based rock band The Strokes. The band has been known for carefully, and at times unexpectedly, evolving their sound since 2001 (the year of release of their first album Is This It). When the band took a turn for more of an ’80s pop-rock sound with their fourth album Angles, fan reactions were extremely polarized. When Julian Casablancas released his solo album Phrazes For The Young in 2009, an album that toyed heavily with an upbeat synth-pop sound, it perhaps should have been a sign that fans of both Casablancas and his band were dealing with a man of many tastes. With his new album Tyranny, and his new band The Voidz, Casablancas has once again thrown convention out the window and delivered surprise and possibly even confusion. When “Take Me In Your Army” ends, the album launches into “Crunch Punch,” which uses loud, fuzzy guitar and Casablancas’ signature raspy yells to shake the listener out of any comfort zone they may have found in the methodical sound of the previous track. From there, the album begins to simply become overwhelming. Tyranny takes so many twists and turns over the course of its hour-long running time that it is entirely possible to begin to feel lost. There is just so much going on within the album, from screeching guitar to plodding drumbeats to string arrangements to experimentation with genres ranging from pop to metal. Through it all, the album begins to sound like it’s suffering from schizophrenia, and Casablancas’ gravelly vocals, ranging from loud shrieks to low, shoegaze-esque moans, begin to sound aimless. It’s almost as if Casablancas is an over-eager (albeit very talented) student, determined to show off EVERYTHING he knows how to do in his final project. That’s not to say the album doesn’t have its high moments. “Johan Von Bronx” and “Crunch Punch” feature slight nods to the cleaner, catchy-yet-rebellious garage rock sound in which Julian Casablancas has his roots. And track eleven, “Nintendo Blood,” features an intriguing vintage pop vibe reminiscent of an ultra-cool 8-bit video game soundtrack. “Father Electricity” even experiments with a frantic Afro-pop rhythm. Perhaps the most memorable gem of Tyranny, however, is “Human Sadness;” an eleven-minute opus about depression and grief that, thanks to string arrangements and a sweetly melancholy bass line, takes its place as one of the most favorable and emotional songs on the album. It is here that Casablancas’ songwriting chops truly shine, as he explores themes of sadness, longing, and desperation over the course of the song. It may not be commercially friendly, but the song is a dazzling example of sonic experimentation done right. Overall, Tyranny certainly has moments of brilliance, and if Casablancas had managed to develop these moments, rather than over embellish them, the album could have reached its full potential. 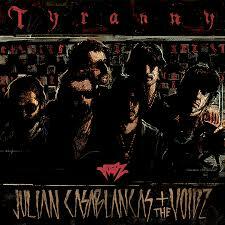 There is no doubt that Casablancas is a brilliant artist with vision, but Tyranny suffers from too much vision. The album has moments of beauty, moments of zaniness, and plenty of creativity, but overall, suffers from too many ideas and not enough executive discrimination. This album is one that is best taken track by track, lest the listener lose touch with the moments of unique beauty for which this album could become a cult treasure.